quantitative and qualitative approaches to measuring the effort, importance of, and impact of students’ and institutions’ involvement in community service, community engagement, civic engagement, and service learning on a college campus. The research ranges between decisions made either as part of institutional agendas, curricular enhancements, or student life initiatives and student and professor involvement in civic engagement activities and supportive attitudes. This is the 162nd volume of this Jossey-Bass quarterly report series. Timely and comprehensive, New Directions for Institutional Research provides planners and administrators in all types of academic institutions with guidelines in such areas as resource coordination, information analysis, program evaluation, and institutional management. Dawn Geronimo Terkla is the associate provost of Institutional Research, Assessment, and Evaluation at Tufts University. Lisa S. O'Leary is a Psychometrician II with Alpine Testing Solutions, Inc. This chapter describes the impact that selected implementation of the revised Carnegie Classification for Community Engagement had on the institutions of higher learning that applied for the classification. This chapter explores the differences between institutions with high levels of involvement in service learning and low levels of involvement as well as the differences between students with high and low levels of involvement. This chapter provides information on estimates of the occurrence and persistence of community service, types of community service performed, and variables associated with performing such services. 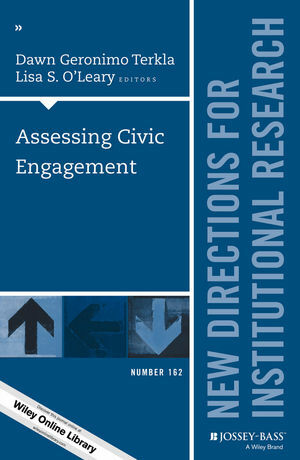 This chapter explores a model that quantitatively measures the impact of the campus environment on civic engagement outcomes. This chapter describes how canonical correlation was used in conjunction with an item response theory model to address the relationship between college students’ civic engagement involvement and attitudes as undergraduates. This chapter describes a case study of one institution’s effort to institutionalize a process through which student development is promoted through active engagement with the community. This chapter describes the impact of an alternative spring break program on students at the Savannah College of Art and Design over a set of years as well as its effectiveness as a service-learning tool. This chapter describes how several tools were developed by faculty and staff at Indiana University–Purdue University, Indianapolis, to assess campus civic engagement initiatives.